When your mother is a famous poet in your home country of New Zealand, it’s not surprising that 17-year-old Lorde (real name Ella Yelich-O’Connor) started out writing stories at a very early age. And she firmly believes it’s her background in writing short fiction that has made her the successful singer-songwriter that she is today. “I’ve never written poetry, but I’ve written short fiction for a long time, and that’s the thing that I read pretty much exclusively,” Grammy award winner Lorde recently explained to Vogue magazine. Lorde—whose debut album Pure Heroine gained her four Grammy nominations—started writing her own songs as a 13-year-old when she was first signed to Universal Music. She realized at an early age that there are things you can do in a song that you can’t do in a short story. “With songs, you listen to the lyrics and you know that not all the words and not all the details and not all the exposition have been included—you kind of expect to take leaps of faith, ” she told Rookie magazine. “One sentence can illustrate an entire experience or concept in a song, which I think is really cool. 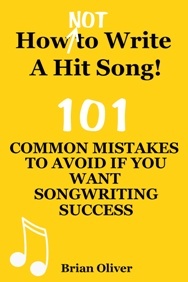 In most hit songs, each verse tends to move the song’s storyline forward like a new chapter in a book, introducing fresh information and images that captivate the listener. The lyrics in each verse should be mostly descriptive (describing people, places and events). The chorus, meanwhile, is meant to really drive home the whole point of the song—for example, by frequently repeating the title line like a catchphrase. The chorus lyrics should be mainly emotional (delivering a strong emotional reaction to what has just been described in the verse).